And from henceforth Pilate sought to release him. But the [crowd] cried out, saying: If thou release this man, thou art not Caesar's friend. For whosoever maketh himself a king, speaketh against Caesar. Now when Pilate had heard these words, he brought Jesus forth, and sat down in the judgment seat, in the place that is called Lithostrotos, and in Hebrew Gabbatha. And it was the parasceve of the pasch, about the sixth hour, and he saith to the [crowd]: Behold your king. But they cried out: Away with him; away with him; crucify him. Pilate saith to them: Shall I crucify your king? The chief priests answered: We have no king but Caesar. Then therefore he delivered him to them to be crucified. And they took Jesus, and led him forth. And bearing his own cross, he went forth to that place which is called Calvary, but in Hebrew Golgotha. Where they crucified him, and with him two others, one on each side, and Jesus in the midst. Let us meditate upon Jesus Christ on the way to Calvary laden with His cross. He falls under the weight of this burden. To expiate sin, He wills to experience in His own flesh the oppression of sin. 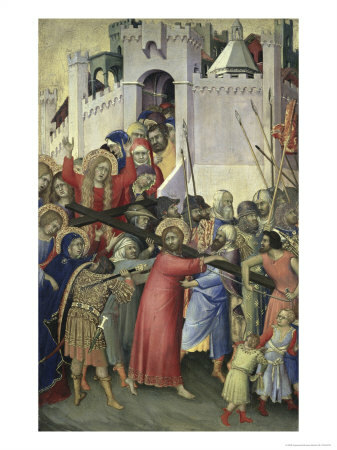 Fearing that Jesus will not reach the place of crucifixion alive, they force Simon of Cyrene to help Christ to carry His cross, and Jesus accepts this assistance.